What do I love as equally as stripes? 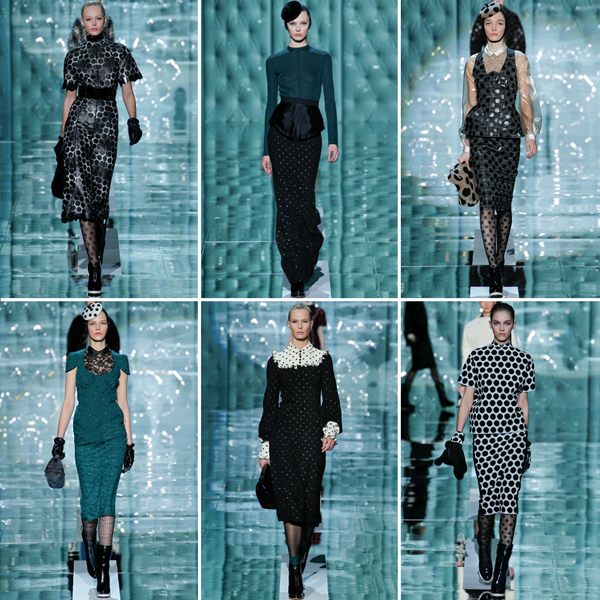 Polka-dots, so I was thrilled to see photos of Marc Jacob's new Fall 2011 collection. Go Dots! According to Style.com Jacobs himself said the new collection was a reaction against the loose, fluid feeling of his Spring outing. "I wanted something strict and severe," he said. What do you think? I like polka dots too! And I was so happy to see Jacobs use them this year! It's nice to see someone else who feels the same way. All of the photos look really cool juxtaposed like that. I love me some polka dots too! And I am also right there with you with stripes. so wonderful!